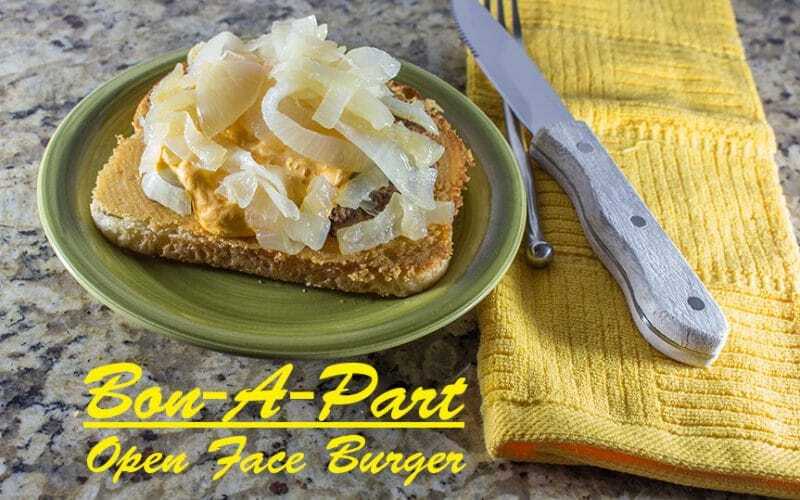 Pub Cheese Burger is a unique open-face burger. Parmesan grilled sourdough bread topped with a charred hamburger patty, pub cheese, and golden grilled onions. One of my all-time favorite ways to eat a burger. This one needs a fork and knife. No, I did not misspell cheeseburger, this is made with pub cheese on a burger, rather than a cheeseburger made in a pub. Though technically, this is a cheeseburger and could be made in a pub………. it is not a pub cheeseburger. I am hearing my beloved Latin professor, Dr. Robert Wolverton, in my head right now, “A difference in the material, makes a material difference.” Pub cheese burger v. Pub Cheeseburger. See how that works? The inspiration for this burger comes from a restaurant that had been a staple in my hometown. The Little Corporal. This burger is best eaten with a knife and fork so you can get the perfect bite every time. This is a fairly simple recipe for a unique burger offering. The most difficult part is getting your grilled parmesan coated sourdough bread just right. It may take a bit of practice to get this part down. I usually have at least one “throw away” piece of bread. It’s a sacrificial lamb, much like the first pancake or two. The best way I have found to pull this off is to butter one side of the sourdough bread with a thin layer of softened butter and press the buttered side of the bread into a plate of grated parmesan cheese. Sliced sourdough bread can be substituted with any sturdy bread that will hold up well when griddling, without absorbing too much butter too soon. Our rustic crusty bread would be a decent option, just keep the slices half-inch or thinner. I just use the grated stuff from the can as it seems to form a crust better than the other types of parmesan cheese. You may need to press the bread into the cheese twice if there are bare spots. It is best to use a preheated nonstick griddle with low sides for grilling the bread. If the pan is too hot it will scorch the cheese. Low heat to medium-low heat is the way to go. The bread is ready when the cheese has become golden brown. Test this by placing a wide pancake spatula under one side of the bread. This is where it becomes convenient to have low sides on your pan! If the cheese is sticking to the bread and some browned cheese is visible it is done. It is best to leave the bread alone until it is ready. Moving the bread around in the pan will just make a mess instead of nice crispy cheese crust. It is best to have the burger, cheese, and onions ready to go when the bread is done. A nonstick skillet with a lid makes all of his easier, right down to cleaning. I usually put the cheese onto beef patties that are still in the skillet I cooked them in, place the sauteed onions into the same pan, remove the pan from the heat and pop a lid on. This will partially melt the pub cheese and keep everything hot until the parmesan bread is ready. To plate, place the toasted bread onto a serving plate, parmesan side up. Place the pub cheese topped burger onto the bread and top with grilled onions. Serve immediately with a knife and fork. 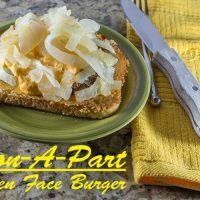 Unique open-face sandwich featuring Parmesan grilled sourdough bread topped with a hamburger patty, pub cheese, and grilled onion. In a skillet, add oil and swirl to cook the bottom of the pan. Turn heat to medium-high and add the sliced onions. Cook, stirring occasionally until the onions have softened, but not browned. Remove the onions from the pan and set aside in a bowl. Butter one side of each piece of bread and place butter side down into Parmesan cheese. Set aside. Wipe out the skillet and add the hamburgers. Cook over medium-high heat to desired doneness. Turn off the heat. Place 2 tablespoons of pub cheese on each burger patty, and place the cooked onions on top of the cheese. Put a lid on the skillet and allow the residual heat to slightly soften the cheese and rewarm the onions. While waiting for the cheese to soften, heat a separate skillet over medium heat. Once skillet is hot, place bread Parmesan side down in the pan. Cook without turning or disturbing until you can see the edge of the cheese turning light golden. Carefully remove bread from skillet making sure to get under the cheese, using a quick motion and a sturdy spatula. Set bread Parmesan side up on 4 separate plates. Remove lid from skillet and place hamburgers on top of the bread. Serve immediately.